At Dan Skelton Racing we are lucky enough to have a variety of therapeutic products at our disposal in order to optimise the physical well-being of our equine athletes. Our FMBS magnetic rug and laser can be individually programmed to suit each horse, and is a great tool for promoting muscle tone and relaxing any tight muscles. 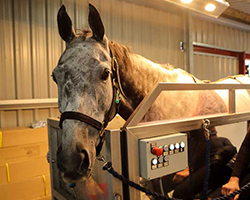 The laser unit can also be used on any sore areas or to reduce any swelling which may occur during training or after racing. We use our Equissage pad and massage unit on a daily basis on any horses around the yard who may be suffering from specific stiffness or soreness, as it acts in a similar way to a human athlete receiving a sports massage. The healing power of ice is just as potent for equines as it is for human athletes, and in order to harness it we have developed specially designed ice boots for the horse to wear post-exercise, after racing and in the event of any aches and pains. Both yards are also equipped with several industrial ice-makers. Horseware Ireland are the makers of the innovative IceVibe Boots, and we use them regularly at Dan Skelton Racing to aid circulation, manage wear and tear on joints and reduce any swelling and soreness which may occur. At both Lodge Hill and Badbury Hill Barn we have installed hot and cold water wash down bays, along with a solariums; at Lodge Hill we have four solariums and there is another one at Badbury Hill. This enables us to make use of the wash down bays not only during the warm summer months, when horses can benefit from a cooling post-work hose down, but also during the winter months. 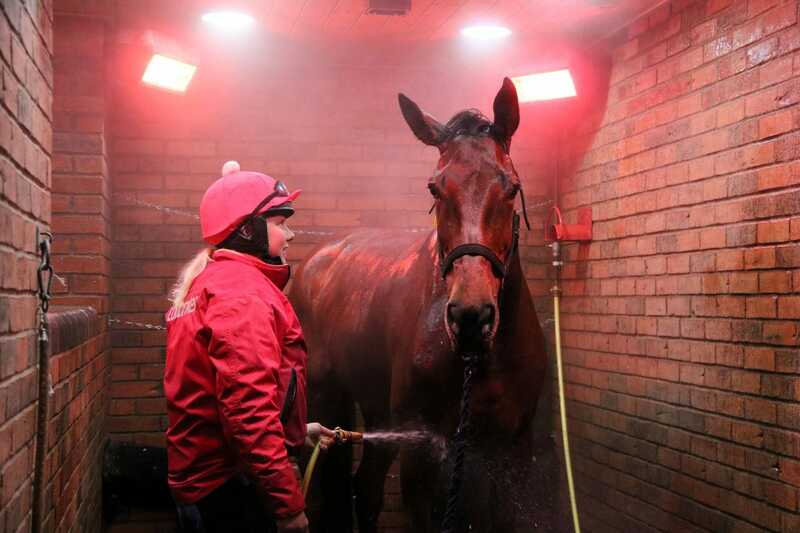 For much of the winter when the temperatures are close to freezing, it would be disadvantageous to wash down horses in cold water, and with a hot water supply coupled with our solarium lights it enables horses to benefit from a good wash down under the warm lights after exercise. The solarium is also hugely beneficial for horses who might be stiff or sore following a hard race, and also helps to keep their coats looking in top condition. It is also something particularly enjoyed by our older horses! 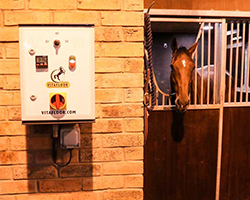 Every yard recognises the need for a horsewalker and we find our two six-horse walkers an invaluable tool for warming up, cooling down and for muscle tone, with the horses walking at a speed of about four miles an hour. It is also the first step back on the road to recovery for any injured horse, and provides a safe and secure environment for the early stages of fitness training for horses coming back into work after a break. 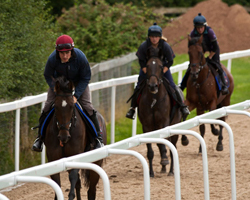 During the season it can be an huge advantage to turn horses out after exercise. This can be useful a variety of reasons, from ensuring the older horses stay mentally stimulated and to vary their routine, to keeping hard-working joints loose and supple. We have two metal turnout pens provided by Claydon, as well as six sectioned paddocks, and these have proved an essential tool in enabling our horses to reap the benefits that daily turnout can bring. As we do a lot of work with unbroken horses that have been purchased from the sales in the spring and summer, we have a lunge ring that allows us to interact with the horses without distraction in an enclosed and safe environment. 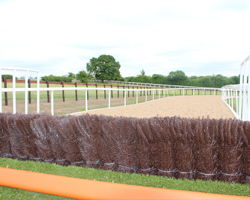 Our lunge ring also has a waxed synthetic surface supplied by Andrews Bowen Ltd and it is also used for those of our horses who need gentle exercise when recovering from injury and for warming up.